Learn how we turn our raw materials into your specified sprockets and chains. Take a tour with us as we show you our capabilities in making all of the products you require! Now you can see what Tsubaki Canada is capable of in just 20 minutes right from the comfort of your own chair! Issue: The application is situated in a very humid and abrasive climate with limited access. During cold weather ice forms on the chips in transportation. 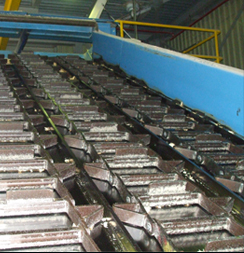 When the chips are dumped on the conveyor the ice is dislodged which jams the chain drive. The customer’s solution was to add salt to the conveyor to melt the ice and free the chips. The existing competitors chain used in this application had pins jamming into the rollers and attachments breaking off due to heavy rusting caused by salt and humidity. Total replacement costs including chain, labor, lubricant and downtime is at approximately $60,000. Tsubaki Solution: After inspection on the application, Tsubaki recommended WDH480C3 with specially pre-greased pins, reversed barrels and hardened custom side plates. On the same visit Tsubaki’s technical support representative noticed the sprocket teeth were knocking directly on the weld joining the barrel and side plate. Only a chain and sprocket manufacturer with superior industry experience could have noticed that. So, we suggested a TWD480C9-XTH60 sprocket made in Canada with a short delivery time. Other features such as special tooth profile and increased hardness were added for better performance. Made-to-order Tsubaki chain and sprocket increased production life from 14,000 hours of service to over 21,000 hours and still running. Cost Savings: Decrease in downtime and increased production performance represented a total annual cost savings of over $10,000. With extra long conveyors come extra operational obstacles to overcome. One major area of concern with extra long conveyors at slow speeds (less than 10m/min) is stick slip. Stick slip can be described as longitudinal vibration of the chain. Stick slip is caused when surfaces alternate between sticking to one another to sliding on one another. Let's look at stick slip within a large roller conveyor chain. There is elasticity within any chain drive. When the drive is started load is applied to the outer surface of the bushing and the inner surface of the roller. The load increases between the two parts until the static friction is overcome and they begin to slide on one another. At this point, and for a brief moment, the load on the parts decreases and the roller rotational speed increases. This energy then dissipates and the cycle starts all over again. This phenomenon can be very troublesome in lines that carry metals that are still in liquid state and need to cool. The constant vibration of the chain causes waves in the cooling metal resulting in product rejection. Initial tendencies are to add lubrication or increase the number of sprocket teeth. These are short-term solutions at best and provide minimal or no results. A couple of ways to overcome stick slip are to increase the conveyor speed or split the conveyor into sections to reduce chain length. A decrease in the friction on parts will also help. Installing a chain that has bearing rollers will greatly reduce the friction and therefore minimize the stick portion of the moving parts as described earlier. The least amount of “stick” the better, as the line will be more fluid in motion.